The F-86 Sabre started out in 1945 as the XP-86, a conventional straight-winged jet fighter. Based on the lackluster performance of the similar design for the US Navy, the FJ Fury, the Army Air Force decided to delay the project a year. While North American gained some experience with the limited number of Furies delivered to the Navy, it was given access to captured research and designs, principally from Messerschmitt's design group. The research centered on swept wing technology and the use of the Messerschmitt spring-loaded leading edge slats to improve low-speed performance of the wing. From this research, North American turned out the first swept-wing transonic fighter, the F-86 as well as the similar looking FJ-2 Fury for the Navy. Production ended with the F-86F-35-NA 'Block 35' aircraft as the Air Force was looking towards the supersonic F-100. When demand from allied air forces for the F-86F exceeded the Air Force's ability to deliver, the F-86F-40-NA was put into production. This aircraft was similar to previous F-86F models except for the wing. The low-speed handling problems of the 'new' 6-3 wing was solved with leading edge slats and an almost two-foot extension to the wingspan. 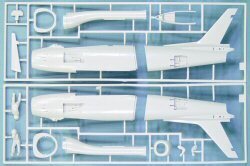 The resulting improvement in low-speed performance caused the Air Force to order Block 40 wings to be retro-fitted to earlier Sabres. 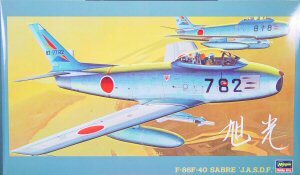 One of the principal users of the Block 40 was the Japanese Air Self-Defense Force (JASDF) that was being established. 300 Block 40s were assembled by Mitsubishi and entered service in Japan. During the production life of the Block 40, new weapons stations and the capability to carry the new heat-seeking Sidewinder missile were added to the fleet. 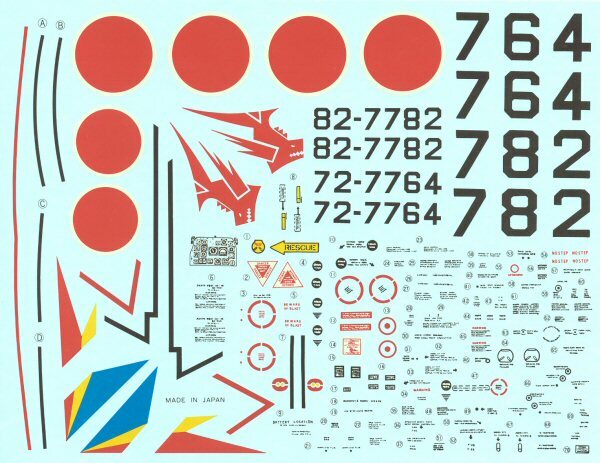 This kit is one of Hasegawa's classics that is periodically re-issued. 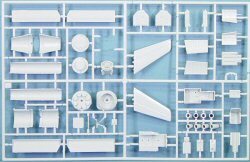 Due to the age of the molds, the kit features raised panel lines and rivet detail. 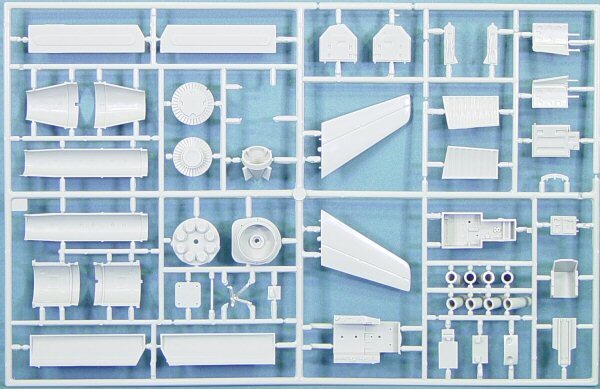 Molded in light gray styrene, this 1/32 scale classic is presented on six parts trees, plus clear parts for the windscreen and canopy. The J47 engine alone is a work of art, build around eight combustor cans. 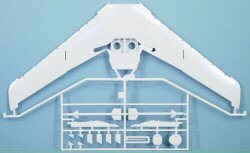 The completed engine is accessible through the removable tail section, just as it was on the production aircraft. A full-length intake duct allows you to see the engine face from the intake. The cockpit isn't bad straight out of the box, but there are several resin cockpit sets on the market and two photo-etched detail sets from Eduard. The gun bays can be left open to reveal the six 50 caliber machine guns inside. The leading edge slats, trailing edge flaps, ailerons, rudder, and stabilators are all positionable. Ditto on the speedbrakes. 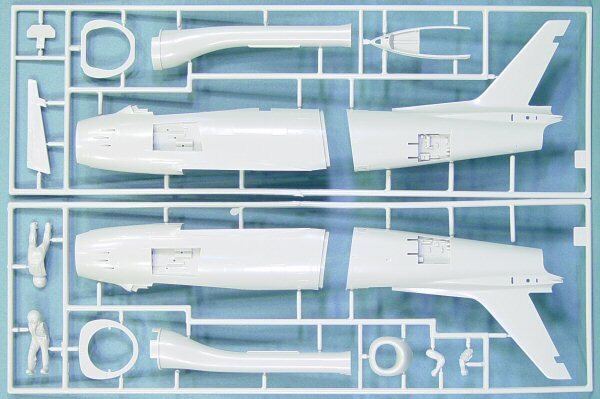 Two sizes of external fuel tank are provided as well as the optional inboard pylons for the Sidewinders. 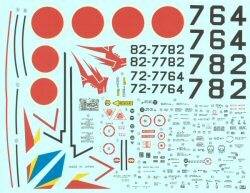 The missiles are included in the kit. 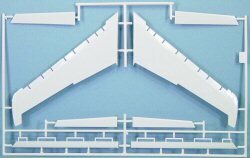 The canopy is designed to be movable after assembly. Despite its age, this kit is still my favorite in any scale. 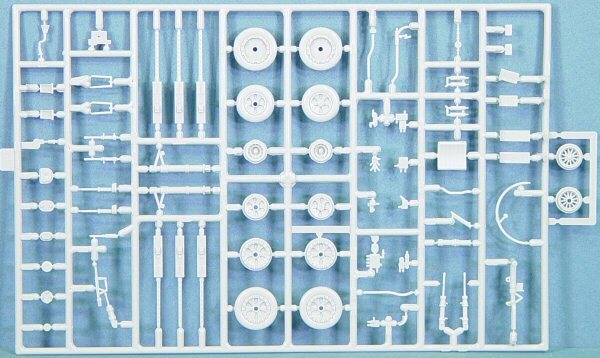 It would be nice to see Hasegawa re-tool this kit with recessed panel lines and rivet detail, and while they're at it, tool up the earlier wings and details to backdate this aircraft to an F-86E. 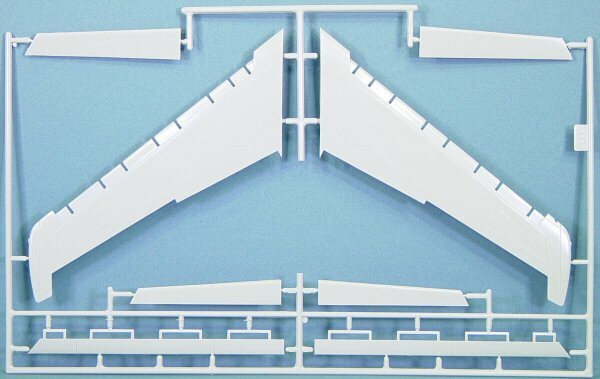 With a little work and a steady cutting hand, you can backdate the wing yourself.